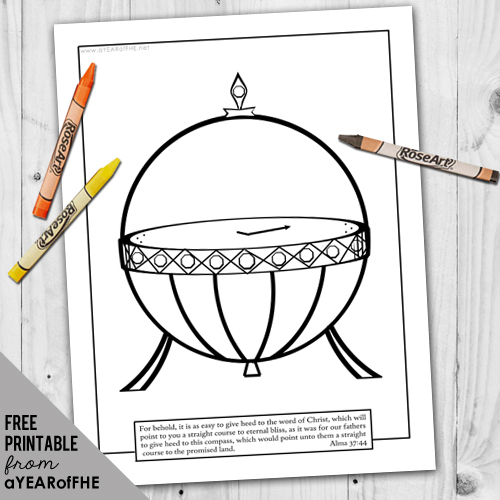 What You'll Need: scriptures, GAK 302: The Liahona, copy of your patriarchal blessing (if you have one), coloring tools, coloring page, Abrahamic Blessings study guide, pen/pencil. Scripture: Alma 37:44 For behold, it is as easy to give heed to the word of Christ, which will point to you a straight course to eternal bliss, as it was for our fathers to give heed to this compass, which would point unto them a straight course to the promised land. 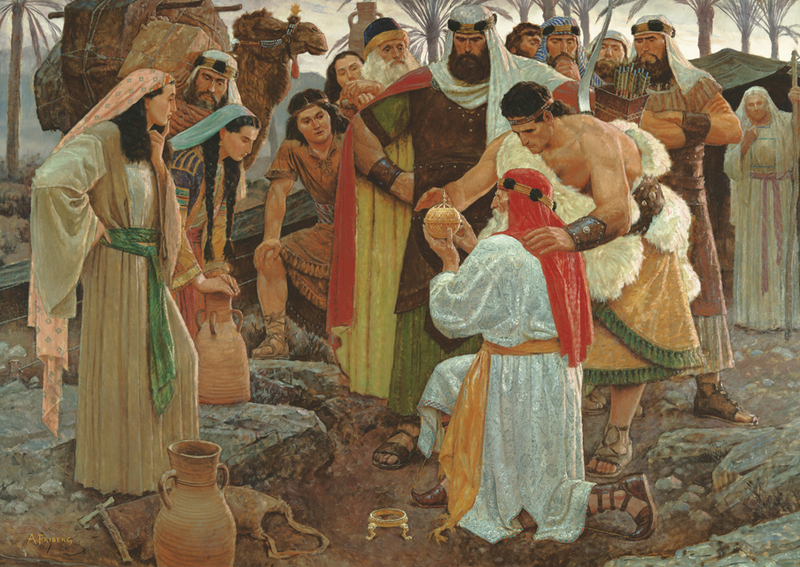 The Liahona was a kind of compass given by the Lord to Lehi and his family when they were in the wilderness. It showed them the way they should go, but only when they were faithful and obedient. - Would you like to have a personalized compass, like the Liahona, to show you which way you should go in life? A patriarchal blessing is an inspired blessing where Heavenly Father tells that person things about their life. It not only talks about our life on earth, but our life before we came to earth and the blessings we can have after this life. It may include promises of blessings the person may receive, warnings about particular temptations or weaknesses, or counsel about how the person should live. It is given once in a person’s lifetime by a stake patriarch. He records himself giving the blessing and later it is written down and given to you so you can study it and use it to help you make good decisions. When can a person receive a patriarchal blessing? A patriarchal blessing is given when a person is mature enough spiritually to appreciate the significance of the blessing and desires to receive it. People often receive a patriarchal blessing during their teenage years, when they are old enough to understand the importance of the blessing yet young enough to use it as a guide in making important decisions in life. How can we prepare to get a patriarchal blessing? The best way we can prepare now to receive a patriarchal blessing is to continue striving to live righteously. We should attend church, follow the commandments and strive to be like Jesus Christ. Bear your testimony about how special a patriarchal blessing is and that it contains promises and counsel from Heavenly Father. Share how you feel about your patriarchal blessing or how it has helped you. Thanks for another great lesson. Excited to use it tonight! My two oldest boys are now very excited to get their Patriarchal Blessings one day :). And thanks to your lessons, we are in enough of a routine with FHE that the little one is fairly reverent throughout the whole thing :). Thank you for this great lesson. My oldest kids were especially interested and are excited about getting their blessings someday. Karen, Almost all of my content is taken from a variety of church materials. That way there is no incorrect doctrine being taught. 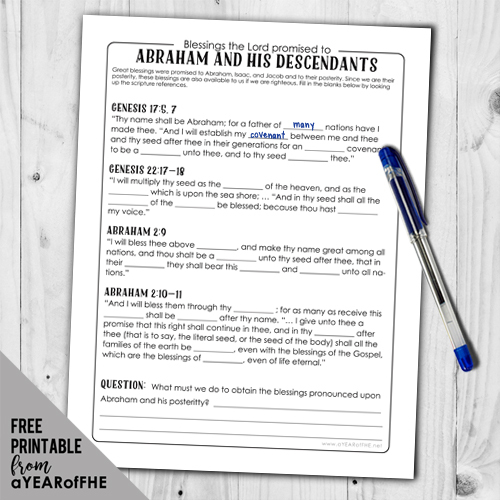 I try and pull info and quotes from a variety of LDS sources into one cohesive lesson for kids. wow this is an amazing way to teach my family and get ready for my own!! It doesn't download for me either.